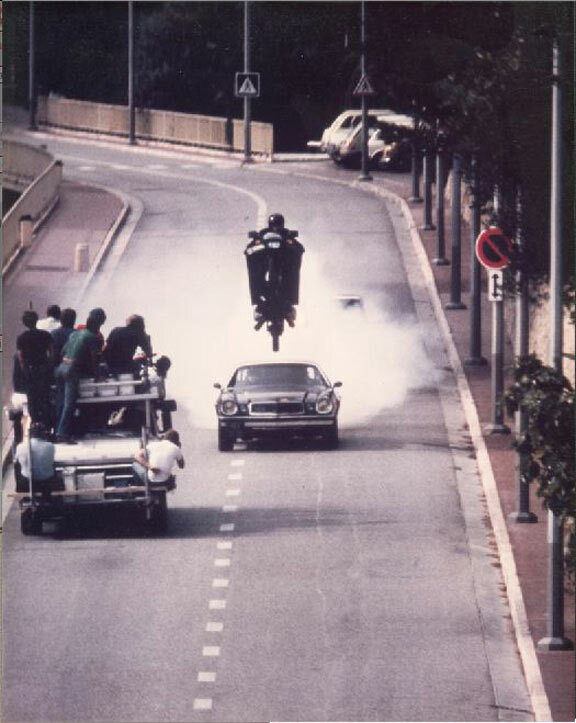 Michael Runyard is a legend in the stunt community. His work spans decades and can be seen in some of the most iconic films ever produced. 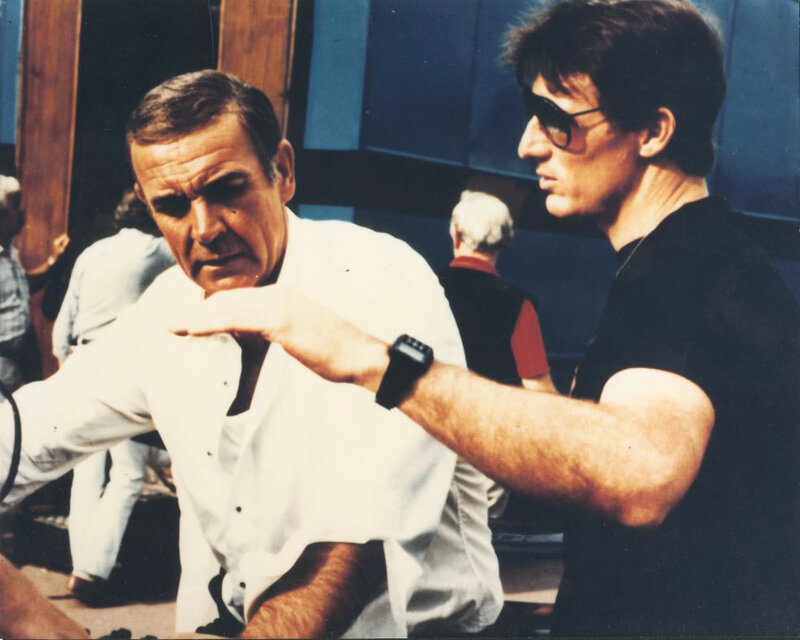 With a seemingly endless archive of behind-the-scenes images from his work over the years, Runyard has sent us some favorites of his days working on the James Bond film "Never Say Never Again", doubling Sean Connery as Bond. 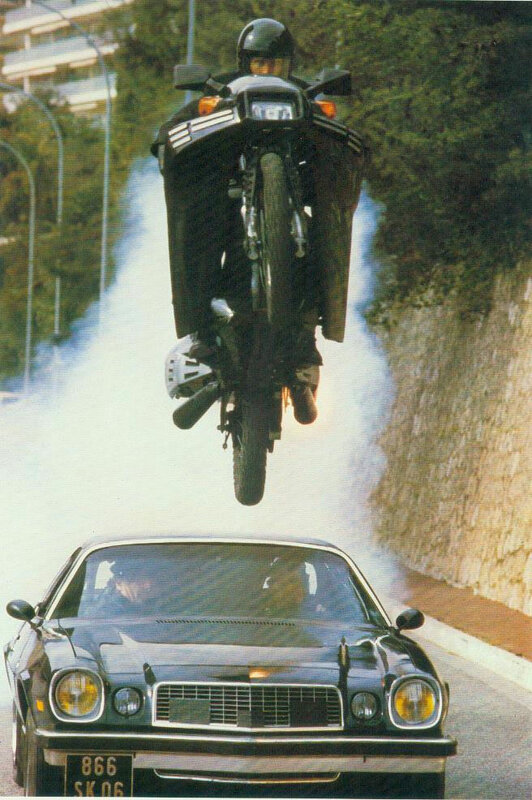 If you've seen any Bond movies, you can surely appreciate a glimpse into the making of some of the amazing stunt work. "This was the first Bond movie that I got to work on—my favorite movies as a kid—and it was Sean Connery’s last time as James Bond. Here I am talking to Sean on 1st unit, after I had laid the bike down and slide under a truck on 2nd unit." 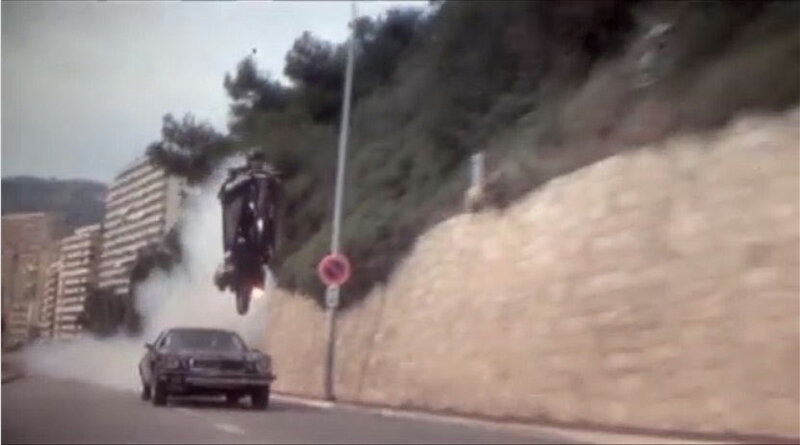 "They wanted me to jump Bond’s motorcycle over a moving car. I had jumped motorcycles from a ramp before, but never a moving ramp, which I found out was a lot different. The Camaro was pulling the ramp at 35mph and I was going around 50mph when I hit the ramp. Because the ramp was moving, the bike accelerated and made the front end go light. The front end was so high when I landed that it slapped down hard and began to break apart. In fact, the landing was so hard that it didn’t matter that I had special wheels made up from Buchanan’s Frame Shop. The spokes were heavier gage and laced at more of an angle to make the wheels stronger." "Through the multiple takes, I knew something was wrong, because the front end was getting harder to hang onto and it was getting lower. It got so bad that I didn’t dare use the front brake, I just let the bike slow down before I jumped off. Thank God I was only going 3 or 4mph, though, when I jumped off. I landed on my feet and did one little tuck-and-roll back onto my feet—just like I had planned the whole thing. I then walked over to the bike and there were just two spokes left in the front wheel. I definitely dodged a bullet." Runyard jumping over a moving car. Sean Connery and Runyard on set for "Never Say Never Again".